Well, it's been nearly a month!? What happened to me? Although, I am now making a baby, which is hard work everyday. Baby is due on 6 April, one month before my toddler turns 2. We didn't time it very well, but we did think it would take a few months longer to get pregnant. 3 months of trying wasn't much, especially when it took us over 2 years, and a miscarriage, to get Isaac. I'm looking forward to the labour, as I know now that's the easy part. And the labour had better go as well as last time, or I'll be a bit annoyed. 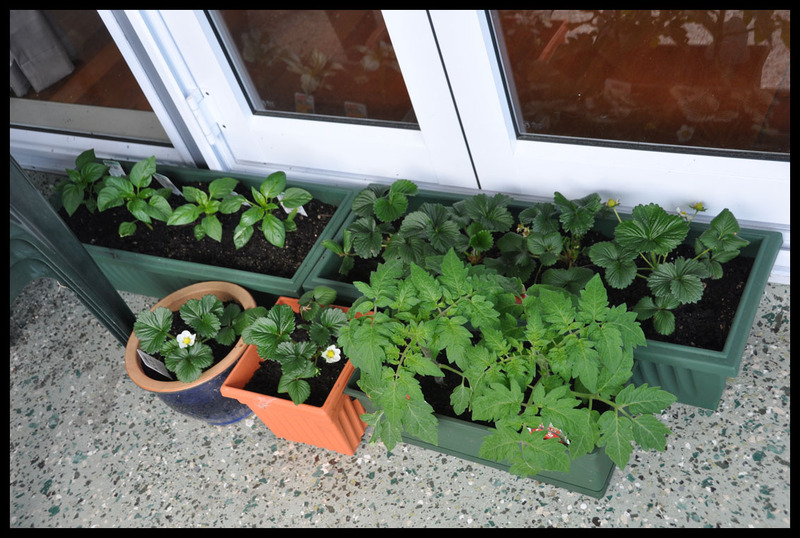 Also in the last month I planted a few veges in some planters (photo above). I have tomatoes, which are thriving, strawberries and capsicums. Can you believe that ONE teeny tiny capsicum is $3 at the supermarket?! Who in their right minds would buy that?! I have resorted to buying the ones in jars. I still have a bit of replanting to do with them, and need to buy some mesh so the birds don't eat my berries. And I have to keep an eye on Isaac, already he has tried to pull the plants apart, and I suspect in a few months he'll be pulling fruit/veges off before they are ready. Ahh, the joys of parenthood. To feel more productive, and now that I think morning sickness is subsiding, I am going to blog once a week with a photo, or maybe two photos! See you next week. I really hope u get a little girl! I'm excited about my little boy but scared too, they seem so different from girls. I had about 3 weeks of feeling good after the MS subsided and then the backache started and the exhaustion! about freakin time steph! I've been checking in here every few days and there's been nothing! I guess with you not being on MSN to entertain me I shouldn't really be surprised!